History records that in ancient times, a bachelor knight honored another worthy, battle-proven soldier by bestowing upon him the rank, style, and dignity of Knight. Later, the Investiture to Knighthood came only after long training in the martial arts, after which the man-at-arms entered into service in a royal or noble army. More than a mere soldier, the Knight held rank, property, and authority. Eventually, as nations established standing armies, the need for the warrior Knight faded away; yet, the discipline, honor, and courage associated with Knighthood remained, so much so that the institution itself evolved into an honors system whose great value made it a coveted prize in any man’s life. While Knighthood was originally granted from one Knight to another, both monarchy and the Church recognized the value of creating secular and religious Orders of Chivalry into which the worthy were admitted as Knights. Thus, we find the first Orders of Chivalry such as the Order of St. John, the Knights Templar, the Teutonic Knights, the Order of the Garter, the Order of the Bath, the Order of the Elephant, the Legion of Honor, the Order of the Holy Sepulchre, and many others. Yet all these Orders took their inspiration from the original Knight Bachelor. The Knight Bachelor developed out of the ninth and tenth century warrior classes; it was centuries later before Church and Government began supervising the development of Knighthood with the founding and growth of religious and secular Orders of Chivalry. The Bachelor Knight was and is a temporal and secular Knighthood. This ancient Knighthood continues traditional practice and is individually and personally granted from a Bachelor Knight authorized to Invest another, meaning that there is no “Order” of Knight Bachelor (but in England the right to confer Bachelor Knighthood is reserved to the Crown). In England and other European countries, as well as in the United States, Bachelor Knights form Associations for the purposes of education and solidarity. The modern Knight Bachelor is the heir of the Ancient Knighthood specified in the Declaration Resolution promulgated on 24 June 1841 in England. While in England and France, chivalric honors are controlled by government statute, in other countries, including the United States of America, such honors are controlled by the respective Orders or by Knight Bachelor associations. Contrary to common belief, there is no law or statute in the United States which prevents a private citizen from receiving a Knighthood and all that pertains to the honor. Many Americans legitimately hold the rank, style, and dignity conferred by Knighthood and may use, if they wish, the prenominal and postnominals granted by their honor. The secular Knight Bachelor uses the well-known title of “Sir." The title is familiar because the press regularly reports the Investing of Knighthood upon distinguished actors and artists as Knights by the British Royal (secular) Orders. The British Knight Bachelor, as well as the Knight Bachelor of any lineage, uses the title (the “prenominal”) “Sir” in the place of “Mr.” or other title, except religious ones. The "Sir" is attached to the first name, not the last; if John Smith is a Bachelor Knight, the correct address is "Sir John," not "Sir Smith." "Sir John Smith" is also appropriate. Letters, called “postnominals,” which follow the name denote rank and membership in Chivalric Orders. The postnominals of the Knight Bachelor are “Kt.B.” An American holding a Knightly title is perfectly correct in using the title in everyday situations if he wishes. The Continental Knight and the religious Knight (that is, the knight who belongs to an Order of Chivalry which was established by Church dignitaries) use the title “Chevalier,” not "Sir." The honorable Estate of Bachelor Knighthood conferred in The Alliance was established in the mid 1940s as a personal honor by His Royal Majesty King Peter II of Jugoslavia of the Dynasty of the Karadjordjevic to honor those who served the exiled Royal House. Because the honor was a gift from the person of the King and to ensure that the honor would be self-perpetuating, the King created both the hereditary Knight Bachelor of Jugoslavia and the ad vitam Knight Bachelor. As the accolade grew in stature, the King, following ancient law, authorized the Knights Bachelor to confer the honor on others. Since the death of King Peter in 1960, His Majesty’s Knight Bachelor lineage has been carefully maintained and passed on individually by select Knights as a treasured distinction. ​To further conserve and safeguard the lineage, The Alliance of Karadjordjevic Knights Bachelor in the Americas was established in 1996 as an independent and educational non-profit association of Bachelor Knights who trace their Knightly heritage to King Peter. The Alliance considers this precious heritage to be a distinguished and rare dignity and honor that can be granted only after careful consideration of the moral and civil conduct and service and character of the man who is the nominee. 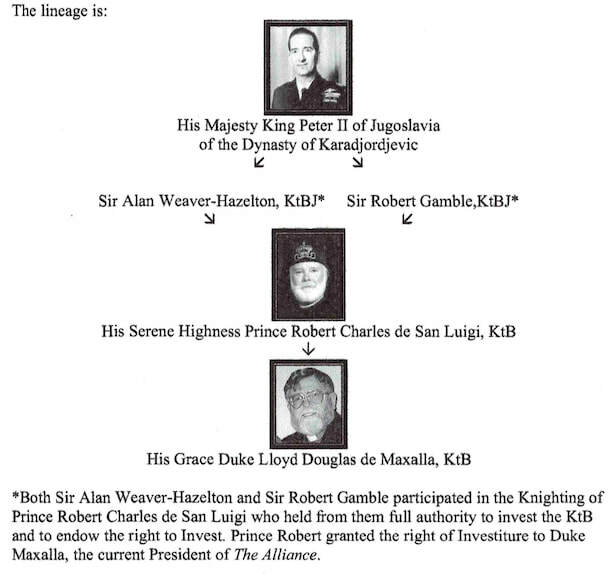 In the 22+ years since the formation of The Alliance, only 6 Bachelor Knights have been invested by the Alliance. The honor is conferred only within an authorized Alliance Investiture. As per its constitution, only the President of The Alliance may confer Bachelor Knighthood, all Knights in the Alliance lineage having permanently and irrevocably ceded that right. The presence of King Peter’s dynastic name in The Alliance indicates lineage from, not patronage by or affiliation with, the present Royal House of Yugoslavia (Serbia). As a self-governing body, The Alliance operates under its own constitution and is not associated with any Royal House or any Order, society, union, or group, other than by a Writ of Filiation.